The CHS Drives Across the Country For Child Life Fundraiser is officially closed with tremendous success! A HUGE thanks goes out to everyone who made this possible!! Read the excerpt below from our facebook page to see where these generous donations are going to work for the kids. 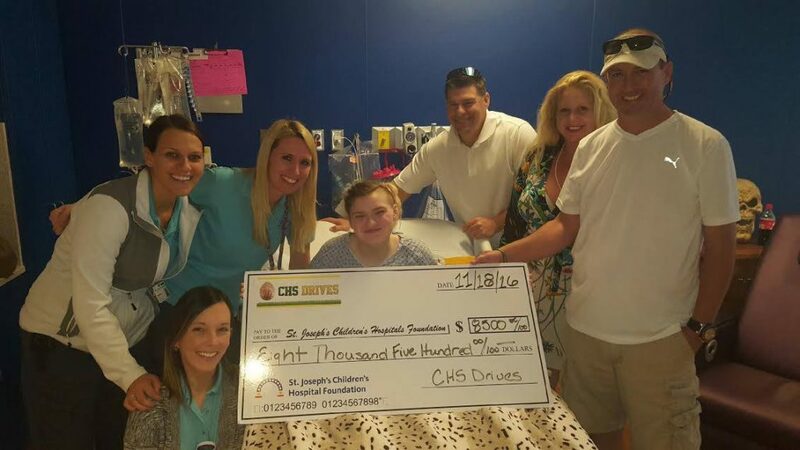 We officially closed out our “CHS Drives Across the Country For Child Life” Fundraiser today with a quick visit with Noni and an official hand off of the funds to Child Life at St Joe’s Children’s Hospital. We had some of the AWESOME Child Life advocates and nurses present also. Doug and I gave Noni some incentive to get better and go home one day soon: I promised that i would take her and her Mom home in my “new” Lincoln and that we would go live on FB with Ryan during the drive home, and Doug guaranteed to make the biggest and best batch of Rice Crispie treats EVER for her. We made her pinkie swear that she was gonna get better and come home soon. I would like everyone who participated in this fundraiser with us to know that the monies raised are going directly to three things that are desperately needed by the sick kids and babies at the hospital. 1. $3500 is going to purchase 30 crib mobiles for sick babies 2. $2k is going to purchase “Treasure Chest” Items–toys etc etc etc to help young children stay incentivized while having to do extensive physical rehabs after injuries and surgeries as well as chemo and other treatments. 3. $2k is going to purchase “Switch and Reward” games used by Childlife team members when playing with kids with disabilities. These games allow and help kids who have difficulty with fine motor skills to be able to play them. And 4. The remaining money is going to be matched by ANOTHER DONOR and those combined funds will go to one of the Infusionarium rooms that are currently under construction at the Hospital. These rooms are for Chemo and other treatments and all I can tell you is that the rooms are SOOOOO COOL that the kids will forget that they are getting treatments while they are in them. It’s like the coolest disney-esque 3-D virtual reality room–Hard to describe. If you google it a video from youtube will pop up! Check it out!!!! Again–Thanks to ALL OF YOU GREAT PEOPLE! SO MANY OF YOU PARTICIPATED AND MADE THIS AWESOME AND FUN!!!! WE AT CHS DRIVES CANNOT THANK YOU ALL ENOUGH!!!! BIG HUGS FROM NONI TO ALL!!! !